TripIt® from Concur®, the world’s highest-rated travel-organizing app, today released features that help travelers access information about the safety of the neighborhood they’re visiting, as well as country-specific travel logistics for TripIt Pro users, within the TripIt app. Now TripIt shows safety scores from 1 to 100 for neighborhoods around the world, representing low to high risk. These scores cover a variety of categories, such as women’s safety, access to health and medical services, and political freedoms. 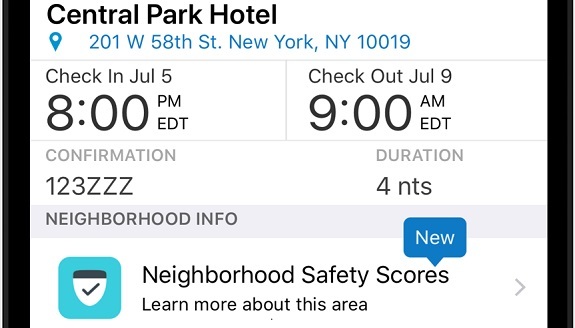 Travelers will find safety scores for their lodging, restaurant and activity locations within their TripIt app. TripIt Pro makes international travel easier by showing logistics such as embassy information, currency conversions, socket and plug requirements, tipping advice and more—for 180 countries. To help support users as they travel around the world, TripIt also supports French, German and Japanese confirmation emails. While TripIt remains English-optimized, travelers who receive confirmation emails in these languages will be able to see those plans, alongside all their other plans, right within their TripIt app. Neighborhood safety scores are available on the Android and iOS mobile apps for all TripIt users. A subscription to TripIt Pro ($49/year) is required to access international travel tools. To learn more about how TripIt Pro can help you stay one step ahead, visit www.tripit.com/pro.